Sea level is rising, and there are several reasons connected to global warming. Extra water enters the sea when ice melts from Antarctica, Greenland and other glaciers and ice caps. Recent research suggests that the glaciers of Alaska alone now contribute 75 gigatonnes per year. Investigating sea level rise involves scientists using many different methods, including satellites which map the surface of the sea. It is also important to look carefully at older records from tidal gauges all over the world. Global sea level rise from the 20th century to the last two decades has speeded up even more than scientists previously thought, according to a new Harvard study. 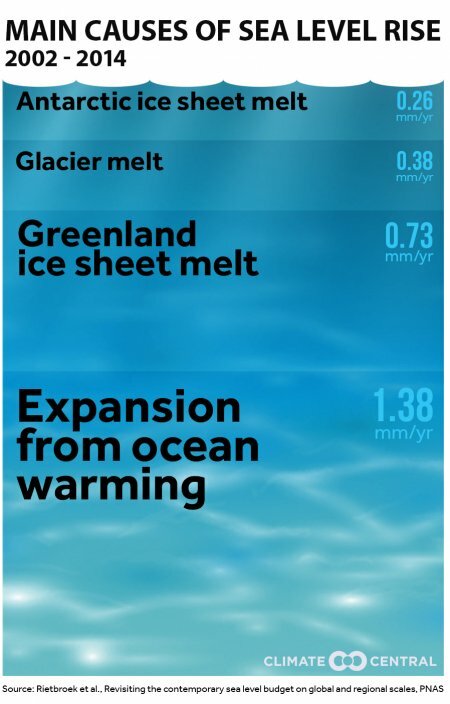 NASA have reported a global sea rise of 6 cm in the last 2 decades.